My heart and prayers goes out to all who suffered from the effects of Hurricane Irene, truly a devastating hurricane in many areas on the east coast. Luckily, my neighborhood in Brooklyn, New York, although listed by FEMA as a flood zone "B," did not receive any flooding or electric power outages during the storm as did many other areas. There were downed tree limbs and tress, and other storm related damage, but we were very fortunate not to have any damage. I was actually away during the hurricane, as I flew to Colorado to go wedding dress shopping with my daughter a few days before the hurricane arrived. Although my daughter will have her wedding ceremony and reception in Brooklyn next spring, she wanted to buy her dress in Denver, Colorado, so that she would be able to do alterations during the months before the wedding. Our first stop was a bridal boutique called Anna Be, located at 1575 Boulder Street, Denver, Colorado. This shop offers dresses by all the top wedding designers, as well as new and upcoming designers. My daughter-in-law's sister bought her dress here a couple years ago, and she and her Mom highly recommended the Anna Be boutique's selection of wedding dresses and their service. When we entered the boutique we were offered champagne by the staff -- what a fun way to celebrate shopping for a very special dress! There were many beautiful dresses to admire and my daughter began gathering quite a few to try on. She had a good idea of the style she wanted and about how she dreamed of looking in a wedding dress. What young woman does not dream about choosing her wedding dress ? I was so happy to be able to share this experience with her! Believe it or not, she actually found the dress of her dreams among the first few dresses she tried on! My daughter-in-law was with us, and she and I both gasped at how beautiful my daughter looked when she tried on "THE DRESS"! It was an Australian designer, Martina Liana, design. My daughter looked absolutely beautiful in the dress she selected. Of course I can't show the dress here, as it will have to remain top secret until her wedding day, but it was on one of the racks in the photos above! Afterward, we went out for tea to celebrate! My daughter-in-law is on the left and my daughter is on the right. Just look at those happy faces! We had such a memorable day together. Of course I was also able to do a lot of grandson snuggling while I was in Colorado! My 5 month old baby "M" is cuter than pie and very expressive. He got lots of hugs and kisses from his "Nonna." My grandson "L" was recently potty trained -- a big event in all two year old's life -- so I brought him the same gift his Daddy received when he was potty trained many years ago, at the same age, which I had saved in my attic over the years. This heirloom Fisher Price Medical Kit was a big hit! He took my blood pressure and listened to my heart and Winnie the Pooh's heart many times. Notice "L's" dinosaur slippers -- a favorite recent wardrobe addition from his visit to the Dinosaur Journey Museum. He has so many wonderful interests now and is quite a smart little boy. It was so good to visit with my family and I already miss them all so much! Baked Gnocchi with Two Cheeses and Walnuts and a Give Away! If there is one food my husband loves it is gnocchi -- a small dense Italian pasta dumpling traditionally made with either potato, ricotta, or semolina. Gnocchi have been a traditional Italian pasta of probably Middle Eastern origin since early Roman times, although the use of potato is a relatively recent innovation, occurring after the introduction of the potato to Europe in the 16th century. When Bertolli asked me if I'd like to try one of their special sauces to prepare their recipe of baked Gnocchi with Two Cheese and Walnuts I was more than happy to oblige! They sent me a kit which included a cavatelli maker, and gnocchi board, a coupon for their Olive Oil and Garlic Sauce and a La Creuset Au Gratin dish, and this recipe. No other compensation was provided and my opinion about this recipe is my own. As you can see from my photo of the completed dish, the results were fantastic! •Combine Sauce, cooked gnocchi, 1/2 cup mozzarella cheese, 2 tablespoons Parmesan cheese and 1 tablespoon basil in 2-quart casserole. Top with remaining cheeses, walnuts and bread crumbs. •Bake uncovered 12 minutes or until bubbling. Sprinkle with remaining basil. In a bowl mash boiled potatoes or rice with a potato ricer. Add melted shortening or oil and egg. On a board or mat sift the flour. Make a well in the middle of the flour and add the mashed potato mixture. Slowly mix the potato mixture and flour with your hands until well blended and it forms a ball. Flour the surface and begin to knead until the dough begins to become soft and smooth. Cut dough in half and allow to "rest" under a damp towel for about 10 minutes. 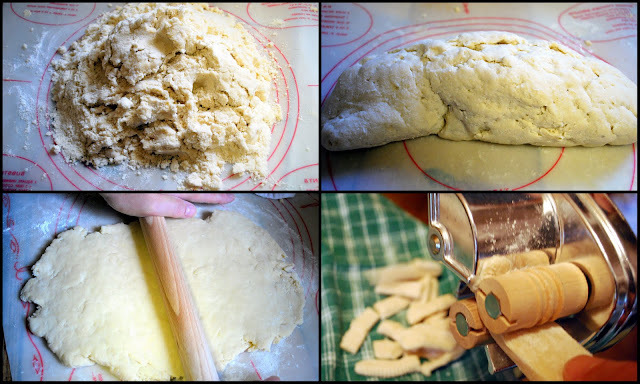 If using a cavatelli machine roll out each half of the dough to a thickness of about 3/8 inches and cut into strips about 1/2 to 3/4 inches wide. Flour each strip and insert one end into wooden rollers of the catavelli maker and turn the handle. As you can see from the photo above this recipe makes a large amount of cavatelli -- enough for three servings! I was able to freeze two servings for another time by spreading the cavatelli on a baking sheet and freezing them until hard and then placing the frozen cavatelli in freezer bags. The baked gnocchi were absolutely delicious! The sauce was flavorful and had just enough garlic to blend well with the two cheeses and fresh basil to make this dish very aromatic. I never thought to incorporate walnuts in a baked pasta dish, and I found them to add a wonderful crunch, along with the bread crumb topping. My husband gave this two thumbs up and we were very happy to eat the leftovers the next day! Bertolli recommends that this dish is accompanied by a rich Barbera wine, as you can see in the film clip above from their special event about pasta and wine pairing. Now for the give away! Bertolli has graciously offered to give the same set that they sent to me to a USA resident, to be shipped from their offices. The set will include a coupon for a free sauce product, a cavatelli maker, a cheese grater, and gnocchi board and a La Crueset Gratin Dish. All you have to do leave a comment and make sure you leave a way to contact you if you do not have a blog. Sorry, but this is for USA residents only. If you would like to become a follower of my blog (not required) I would be thrilled to have your interest and friendship! If you are a facebook user, please check out the Bertolli Tastes of Italy map and add a tip, story recipe or photo from your favorite region of Italy, and join in all the fun! The winner of the give away will be chosen by me through the use of Random.org on Monday, September 5th, 2011. Good luck! I'm linking to Foodie Friday on the Designs by Gollum blog and Mosaic Monday on the Little Red House blog. Thank you to both wonderful blog hosts--please visit them and see all the wonderful entries! Edited 8/28/12: Thankfully my house and neighborhood survived Hurricane Irene! Thank you for you concern, and prayers. I am thinking and praying for all those who were affected by this severe storm. edited 9/5/11 9PM EST: Comments now closed --winner chosen, and to be announced soon! Thank you to all who entered the give away. I enjoyed reading all your comments! Yes, I felt my whole house shake with the earthquake that occurred on the East Coast this afternoon! My house felt as if it was moving up and down and my chandelier began to swing slightly and my dishes were clinking in the kitchen cabinets. I didn't know what to do at first, but I quickly grabbed my phone and ran out to the front of my house and I saw most of my neighbors also running out of their homes. It was definitely a scary situation! Earthquakes are a common occurrence world wide, judging by this link on the United States Geological Society, but we don't often feel them here in New York. I heard an explanation that the East coast shakes much more at a lower magnitude and extends further from the epicenter because the crust under the East Coast is colder and firmer than the West Coast. The epicenter of this earthquake was reported about 4 miles southwest of Mineral, Va., near Richmond, Virginia, and about 80 miles south of Washington, D.C. It was felt as far north as Boston, Massachusetts. The magnitude was rated between 5.8 and 5.9. The video below shows the White House and the Capital Building in Washington DC, shaking during the earthquake. Direct link is here. The East coast is also preparing for Hurricane Irene which is expected to come on shore by Thursday morning. The storm is expected to be traveling due north toward North Carolina as a Category 3 hurricane, meaning that it will have winds of 111 to 130 miles (178 to 209 kilometers) an hour in South Carolina and move up the coast towards New York by Sunday. Mother Nature has certainly been keeping us busy! As you can see I grow quite a bit in flower pots. 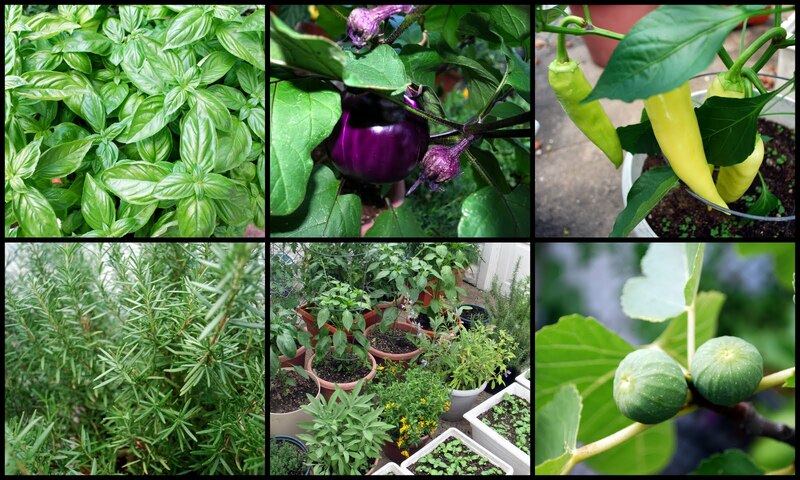 I guess this city girl is a frustrated gardener! I am adding this post to Jenny Matlock's "Alphabe Thursday." The letter this week is "S" -- I think shaking in an earthquake qualifies! 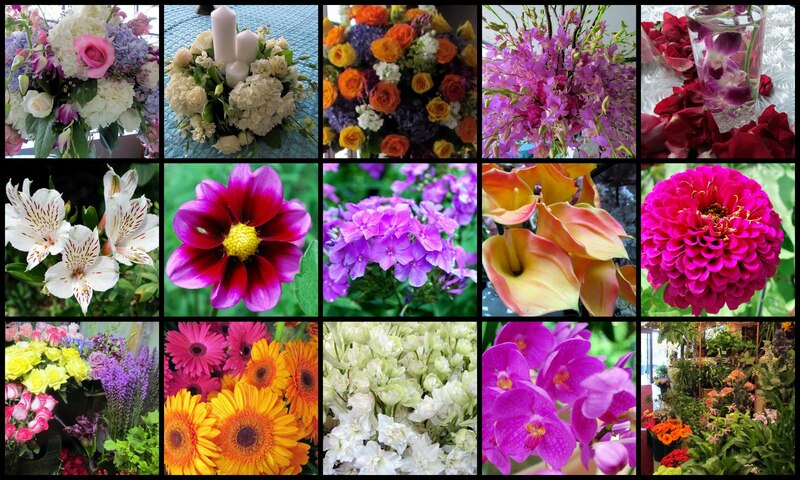 My husband and I have been quite busy lately visiting florists and wedding flower showrooms trying to help our daughter decide what flowers and arrangements she and her fiance would like to have at their spring wedding ceremony and reception. Since my daughter now lives across the country, it has to be done with the help of websites and photos and lots of telephone and e-mail conversations. It's not the easiest way to get this feature of the wedding plans done, but I have had a lot of fun photographing pretty flowers along the way, as you can see in this collage of some that caught my eye. Shades of purple are my daughter's color of choice, but I couldn't resist also taking photos of some of the autumn hues, as they are my favorite! We've had so much rain the past week that my flower box impatiens flowers have all perked up! I love how they flower all summer long and fill my yard with beautiful color. Daylight is shortening, and the end of August fast approaches, but I know summer will not be over until the figs on my tree ripen. Maybe yet another week or so? It is always an exciting time for us! What are you doing to enjoy these last weeks of summer? I'm linking with "Rednesday" on Sue's blog It's A Very Cherry World and "Outdoor Wednesday" on Susan's Blog A Southern Daydreamer. Thanks for hosting each week!! A friend recently wanted to visit her brother in a suburban Philadelphia hospital and asked if I would come along for the ride to keep her company. She told me we'd stop at the famous Philadelphia 9th Street Italian Market for a quick lunch before heading home, so I was excited for a chance to see what that market was all about. I love visiting ethnic markets and in the past I've blogged about many different ethnic markets in Brooklyn, NY and also the Bronx's Arthur Ave Italian Market, so I was curious to see if the Philly Market would measure up to my expectations. It certainly did! 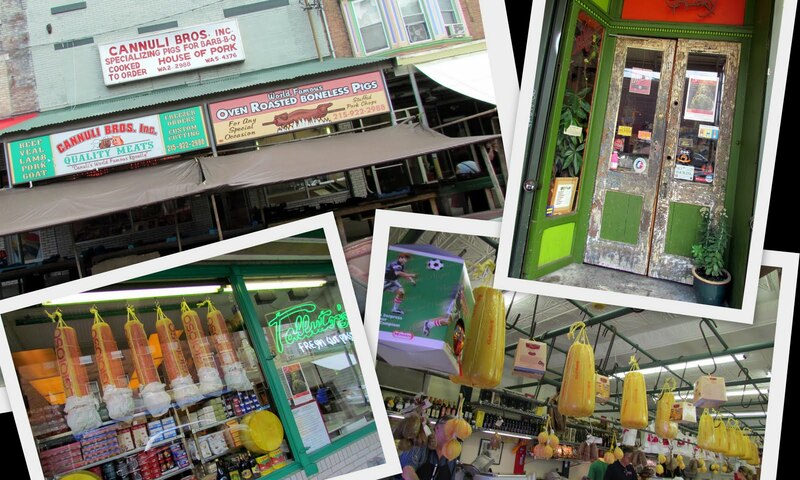 I learned Philadelphia’s Italian market was the oldest and largest working outdoor market in the United States. Located in the heart of this historic Pennsylvania city for over one hundred years, the Italian Market is located on 9th Street and runs from Wharton Street to Fitzwater Street. The market features bright colorful metal awnings which cover the sidewalks where vendors of fruit, vegetables, fish, and housewares, both inside and outside on wooden tables, and conduct business year round. Ground floor shops in traditional Philadelphia row houses line the street. Many owners still live above their shops. The broad awnings across the sidewalks shield outside market shoppers from sun, rain and snow. There is definitely a wonderful old world patina appearance to the storefronts and streets. The area continues to attract new immigrants, as there are now a number of Asian and Mexican run businesses which have joined the traditional Italian shops in the market. The market hours of operation are Tuesday through Saturday, 9 AM to 5 PM and Sunday 9AM to 2 PM. We stopped at Paesano's, located at 1017 South 9th Street, for what they describe as a "Philly style sandwich with Italian inspiration." Click on the highlighted words to look at their unique sandwich menu! Paesano's may be a small, casual counter service establishment, but they are famous for their home made lamb sausage and Sicilian style chick-pea pancakes. 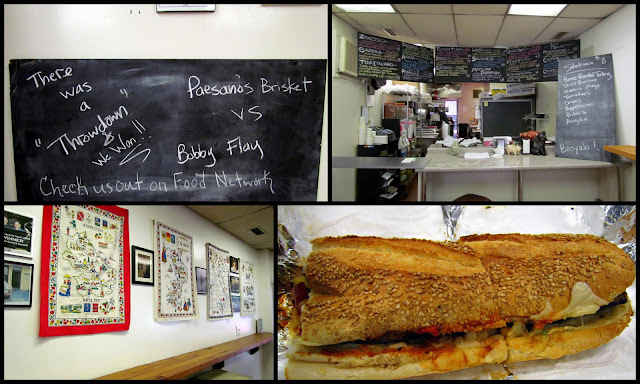 They have won numerous awards for being the Philly's best sandwich shop and for having the best "hoagie" in Philadelphia. My friend and I both ordered their "Zawzeech" sandwich, which was made with a crusty Liscio bakery sesame seed bread, sweet Italian sausage, caramelized peppers and onions, sharp Provolone and pepperocinos. It was a delicious and hearty meal! We wanted to beat rush hour traffic back to New York, so we did not have too much time to shop in the market, but one place I had to see was the legendary Fante's Kitchen Wares Shop, located at 1006 South 9th Street. It has been in the Italian Market since 1906, and is one of the United State's oldest and most distinguished resources for cook wares. Julia Child, Emeril Lagasse, Jacques Pepin, Lydia Bastianich, and Guy Fieri are among the famous chefs who have shopped here. 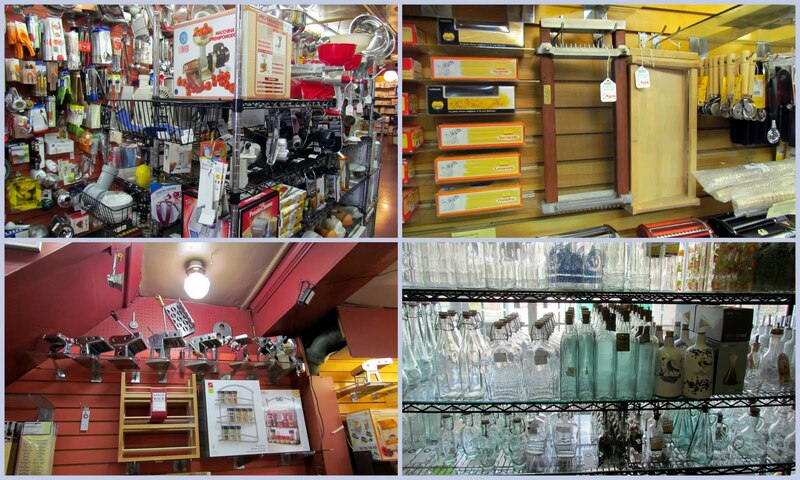 It was jam packed with a full selection of cookware, cutlery and many thousands more quality products and kitchen utensils for both professional chefs and home cooks. I went into sensory overload just looking at every imaginable gadget, pasta maker, serving dish, bottle, baking pan, appliance, rolling pins, etc. I was so overwhelmed that I wanted to spend hours just looking around, and I couldn't decide on what to buy! I'm making a list so the next time I visit I will be prepared. Fante's has an online catalog of just a small portion of their goods, but I think you will agree that if you can't find what you are looking for at Fante's, you can't find it anywhere else! The Philadelphia Italian Market is definitely worth a visit as it is a fun shopping and dining experience! Many thanks to all the hosts! Derek Jeter Honored for his 3,000th Hit! 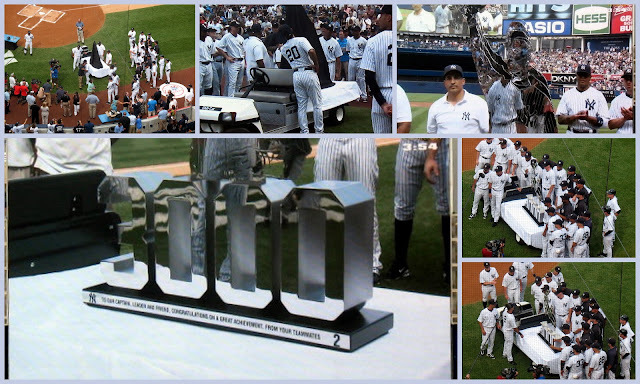 On Saturday I went to Yankee stadium to see a game between the New York Yankees baseball team and the Tampa Bay Rays. 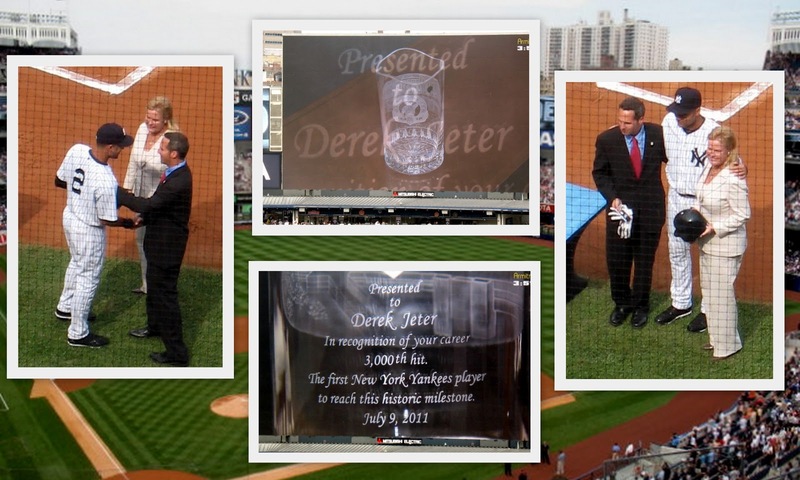 Before the game a few special presentation ceremonies were held to celebrate the Yankee shortstop Derek Jeter's recent historic milestone of being the 28th major league baseball player and the first Yankee ballplayer to get 3,000 hits. Jeter accomplished this feat on July 9th, 2011, in a home game against the same Tampa Bay Rays. First, Jeter donated to the Baseball Hall of Fame representatives the helmet and batting gloves that he wore when he homered for his 3,000th hit. Then the Yankees’ president, Randy Levine, and the team’s chief operating officer, Lonn Trost, gave Jeter a 14-inch inscribed Waterford crystal vase. Jeter holding the commerative Waterford vase. Next, Hal Steinbrenner, the managing general partner of the Yankees, and his wife, Christina, presented Jeter and his father, Dr. Charles Jeter, with commemorative rings, while Jeter's mother and sister were presented with pendants of the same design. 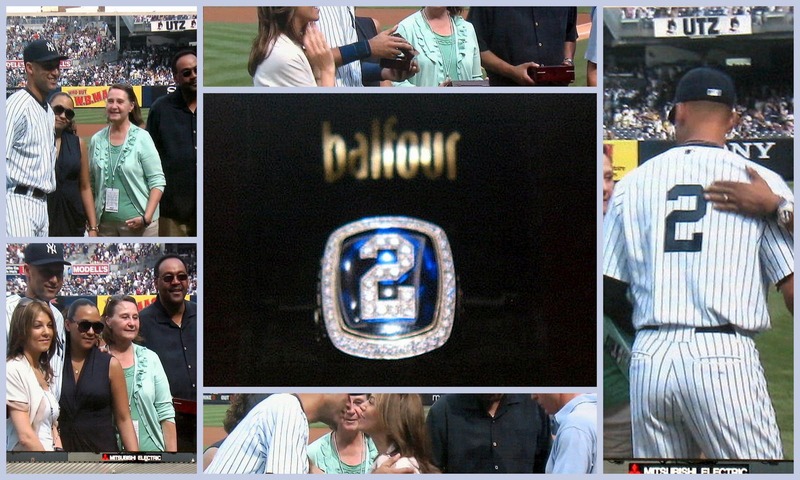 The rings Jeter and his father received have 50 diamonds each, 14 making the No. 2, whcih is Jeter's uniform number. Finally, the entire Yankee team presented Derek with a a 225-pound, mirror-polished stainless steel sculpture. It featured the No. 3,000, topped by a triple-layered bust of Jeter waving his helmet to the crowd. The inscription under the number 3000 reads: "To our captain, leader and friend. Congratulations on a great achievement, from your teammates." The Yankees went on to win the baseball game by a score 9-2, including two more base hits by Derek Jeter and a grand slam by Jorge Posada! I wasn't lucky enough to be in Yankee ballpark attendance when Jeter got his 3,000 hit, but I was excited to be present for the special pregame ceremonies honoring him, as he is one of my favorite players and definitely a baseball legand in his own time in the manor of Babe Ruth, Lou Gehrig, Joe Dimaggio and many other Yankee and baseball greats. Congratulations to Derek Jeter! I'm linking to "Mosaic Monday" with Mary of The Little Red House blog, Sally's "Blue Monday" on her blog Smiling Sally, and the My World Tuesday crew. Please visit their blogs and enjoy their special blog events! To the good I do today ! I was going to link my post of The Peggy Rockefeller Rose Garden in the New York Botanical Garden to today's Pink Saturday post, but today is a special "Miracle Makeover" Pink Saturday event on Beverly's blog How Sweet the Sound and she asked that we post an inspirational thought, prayer or blessing, instead of our usual posts. The poem/prayer listed above was printed once in my church bulletin a few years ago and hit a chord with me. I cut it out and post in on my refrigerator so that I could recite it every day as part of my morning meditation. Expressing gratitude for my blessings and asking for wisdom to live each day well and and to show kindness is something I hope to do more of each and every day. Each comment left on those blog will earn a $1 dollar donation for the next Design Gives Back blog's "Miracle Makeover" of a room in a cancer's victims home The goal is 5,000 comments! Please make your comments work and spread the news! Many thanks! While on my way to visit a florist on Long Island, I passed this beautiful older house located at 2045 Jericho Turnpike, in New Hyde Park in the town of Hempstead. That's right! The sign above the porch said it is a "McDonald's" of the famous fast food chain! Totally intrigued by how this old mansion became a McDonald's, I decided to stop in for a cup of coffee and look around. The photo above shows the entrance floor, indicating this was McDonald's Number 12,000, dating back to 1991. A plaque on the inside wall indicates that the house was the Denton House, circa 1875 and designated as a landmark by the town of North Hempstead. According to the Denton Family Genealogy web site: "The original owners reportedly were descendants of Richard Denton, a Presbyterian minister who arrived in the New World in 1630 and helped to found the village of Hempstead in 1643. Another Denton, Augustus, was a Nassau County politician at the turn of the century. After World War l the house was no longer inhabited by Dentons and became first one and then another restaurant. When McDonald's acquired the Denton property in 1985, says Lawrence J. Anderer, Jr., the current owner/operator, the company intended to demolish the then dilapidated house and build one of its standard eateries. But residents of the village of New Hyde Park and the Town of North Hempstead obtained local historic designation and struck an agreement whereby McDonald's would restore the Structure's exterior to its appearance in a 1926 photograph -- with an allowance for a low-profile, single story addition to the rear." 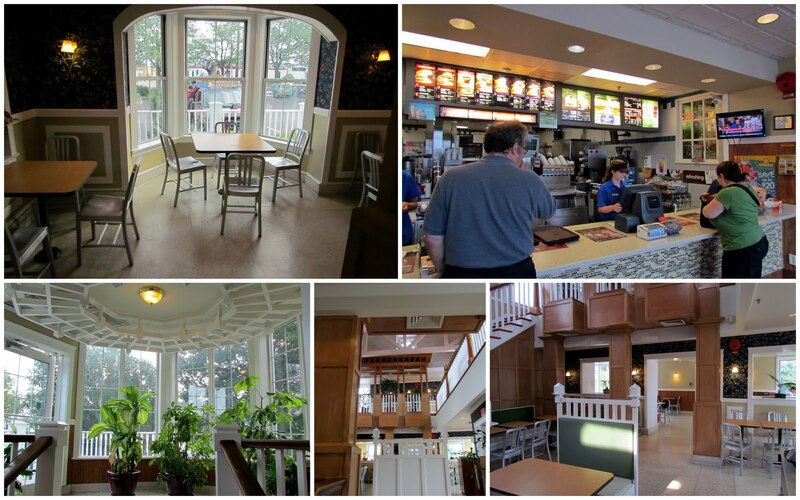 The inside of the house was three stories high with an impressive staircase, but other than that it still looked like the average McDonald's and sold the normal fast food fare. It would certainly accomodate a large party, if one was so inclined to have one there! Meanwhile, back at home, my little flower pot garden has been rewarding me with some wonderful eggplants, peppers and cherry tomatoes, so there was no need for fast food as I decided to make my own dinner that evening. I made a roasted garden vegetable pizza! I sliced and roasted my garden vegetables on a tray, after brushing them first with a little olive oil, in a hot 425 degree oven, until they were soft, about 15 minutes. If it weren't raining I would have grilled them outside on my barbeque grill. Earlier in the day I had prepared a Food Network recipe for whole wheat pizza crust, which I baked first at 500 degrees for about five minutes to set. I then layered the roasted vegetables on top of the crust and covered them with freshly grated mozzarella cheese and some fresh basil and oregano from my garden. I returned the pizza into the oven for another 10 minutes, until the crust was crispy and the cheese was melted. Belissimo! There is nothing like a good home made pizza and it was a wonderful way to eat vegetables! I'm joining the "Foodie Friday" event on Michael's blog "Designs With Gollum." and Friday Food weekly feature on Momtrends. Please visit both blogs and enjoy a visual feast!